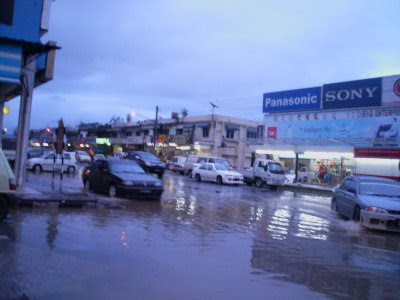 The persistent winds and rains coupled with the king tide have caused a flash flood at Bintulu's banking street, Somerville Road. I have not seen any such occurence since at least 20 years ago. At the point of time the flash flood occurred the high tide at Bintulu reached a 6 m reading. 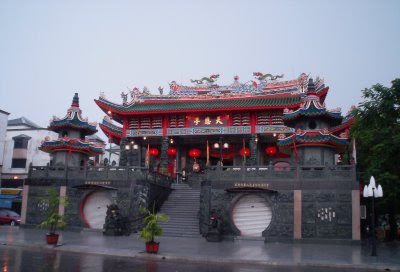 The newly renovated exterior of the Chinese temple in downtown Bintulu. This picture is taken just after the rains have stopped and the carved walls appeared much darker grey than when dry. 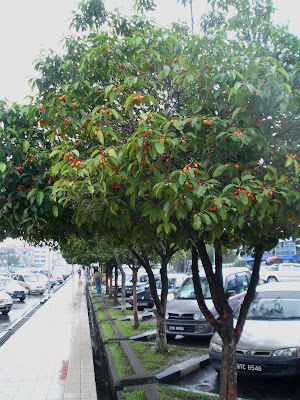 The Tanjung tree ( Mimusops elengi ) opposite Pasar Utama. I could hardly do much work outside or in the open this January and is easy to imagine how difficult it is for civil contractors to beat the weather in order to complete their projects in time. Going around Bintulu town and taking photographs from inside the car seems to be my favourite pastime in January. 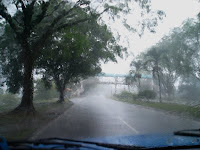 The above is a view of Tanjung trees that provide some shelter from the light shower. The ripe seeds are orange in colour, oval and about 2.5 cm long and it is from seeds that the tanjung trees are usually propagated. The seeds are also very attractive to the birds. The road leading to SMK Bintulu overhead bridge.